Caterpillar - probably from Old French chatepelose which means 'hairy cat'. Granted, some caterpillars are jolly hairy, but one wonders if the numbnuts that named them had ever actually seen a cat. Or a caterpillar. Bizarrely, this catty comparison exists in other languages too - in Swiss German a caterpillar is a Teufelskatz, which literally means 'devil's cat'. Oh, hang on a second ... if I really squint ... and look at it when it's kind of dark ... no ... nope ... definitely not. I'm sorry, but a caterpillar looks absolutely nothing like a cat. Still, catlike or not (and they're not), caterpillars do metamorphose into breathtakingly beautiful butterflies, one of the most miraculous and awe-inspiring transformations in the natural world, so one can't hold too much against them (but, seriously, be careful about holding them, as they're often poisonous). Oh here's one that looks like a cat! Oh no wait. It doesn't. At all. What's 'caterpillar' in your language? Can you see the hairy cat? Do please cater your pillar in the comment box below. Oh lordie. This brought back some not nice memories. Quite a few years back when we lived further south in a milder climate, we had an attack of tent caterpillars. It was a population explosion, and it was ugly! They were everywhere, and completely devoured the leaves on the trees. If you want to be grossed out, do a search for the little b*s*a*d*s!! Oh, and they have absolutely no likeness to cats!! Aww ... and yet the page I looked up on tent caterpillars described them as "sociable" creatures with "remarkable abilities". Oh, and it also said they could defoliate tens of thousands of acres of woodland in a single population bloom. Yeah, I can see how that would be irksome. My husband tells me that the Dunbar caterpillar hunts other caterpillars. It chases them down, too. That's slightly cat-like. Mind you, the Water Veneer caterpillar lives under the water, and I've never comes across a cat that's a happy swimmer. Is the Dunbar caterpillar hairy? If so, your husband might just have solved the riddle (even though I'm pretty sure it still won't look like a cat). I've always found Caterpillars slightly unnerving. They may have beautiful designs like in the photos but there's something slightly sinister in the way they move about. Almost a Terminator like unstoppability to eat your prize begonias. I can't be the only one surely? I was in Barbados staying with a family, and I happened to mention at breakfast that there had been a caterpillar in the shower when I went for my morning ablutions. Everyone immediately stopped talking and looked at me. "Oh it's OK," I said, "I picked it up and tossed it out the window." Eyes widened in my direction. "What colour was it?" they said. "Oh, it was multicoloured - red and orange and yellow. And very hairy too." Someone dropped their spoon with a loud clank (just for dramatic effect), and I'm pretty sure I heard a gasp. Apparently, I had handled a very dangerous caterpillar, the hairs of which can lodge in your eyes and mucous membranes, and the poison of which can initiate anaphylactic shock. Ever since then, I have indeed been just a little wary of caterpillars. In Belgium, when they're spotted, they burn the nests down with a flame thrower. True story. Okay, not so true story. I probably was confused with this dream I might or might not have had where a flame thrower might or might not have been my choice of armour against filthy insectoids (I really, really do not like insects). So in 2014 our most effective ways of dealing with caterpillars is either giving them a make-over or incinerating them with a flamethrower? I read that during metamorphosis their innards completely break down into a sort of biological soup before reforming into a butterfly. Rather remarkable. 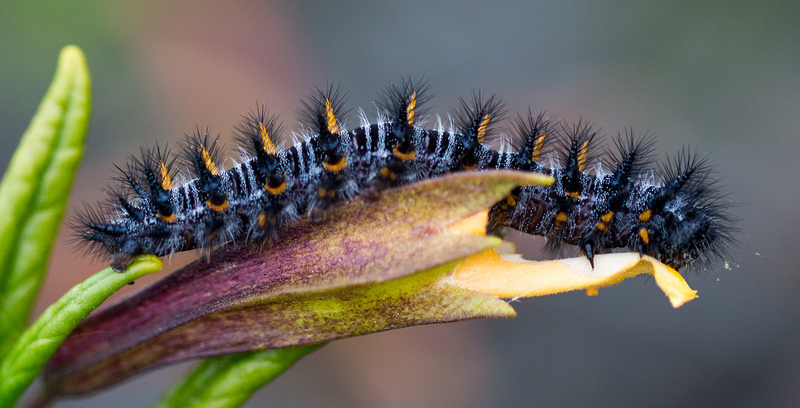 Caterpillars move by squishing their guts forward first, and then their outsides follow. AND they turn into goo when they metamorphose. So totally cool, and so totally yuck. 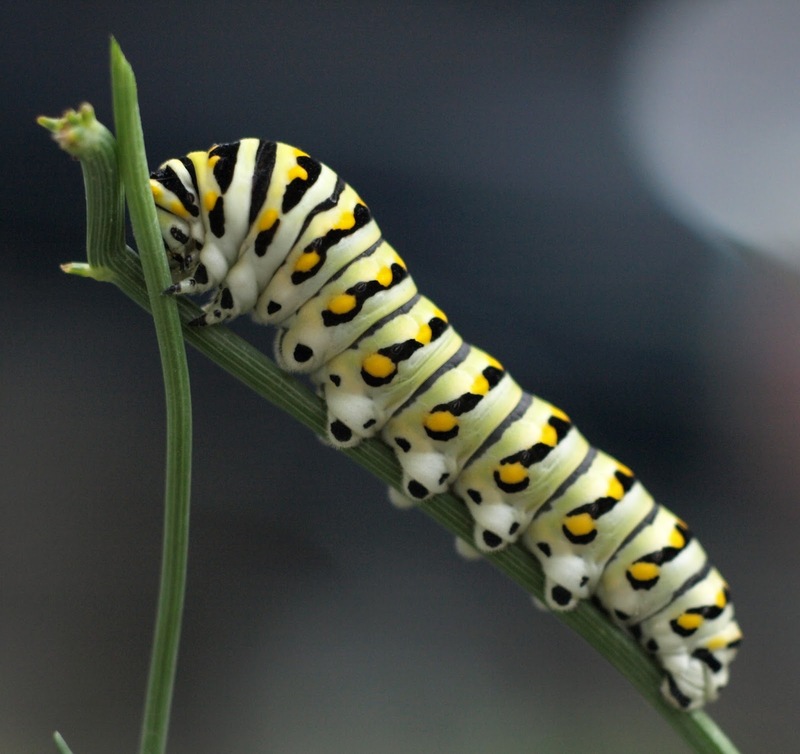 I wondered if the post-metamorphosis creature is, effectively, a different creature, but while researching caterpillars for this post I read somewhere that in some species there is evidence that the butterfly with remember certain things that it experienced in caterpillar form. I didn't have time to really go into that to confirm that it's true, but if it is, that's incredible. Hairy cat? Hairy twig, more like. Or hairy bird poop. Cacapelose. Guess what a caterpillar is called in Dutch. Go on, do it. Imagine a caterpillar in your best possible Dutch. Bet you didn't call it a rups, eh? That is, however, what we call the little beastie. Rups. Rups is, coincidentally, the Norse word for when a warrior burps having eaten a caterpillar. Aaaand ... just checking that in the OED ... oh yeah ... C's right ... it's related to the word 'rupture'.